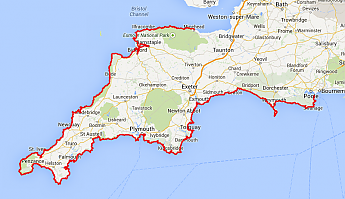 Hi, I'm in UK and am walking the South West Coastal Path in England later this month with my dog to raise money for Prostrate Cancer UK. 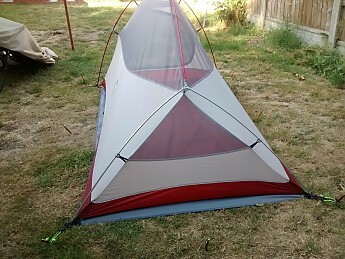 After a lot of searching for a light 2 man tent within my budget, plus being claustrophobic ruled out the tunnel style tents, I bought this one which I think is a copy of an American tent. It's an inside first tent with a throw over fly. As this will be my 1st venture at multi day hiking, it's 630 miles and between 45 - 60 days with a mixture of Campsites and Wild Camping, I wanted to test everything out so for the past week I have been sleeping in the tent with the dog. 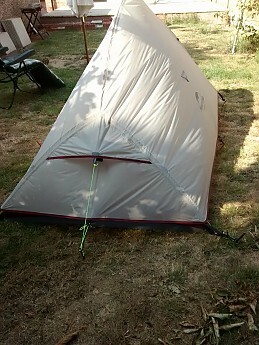 Each morning the inner surface of the fly is wet, which is what I expected, and the inner tent, which is 50% mesh, is bone dry - all good so far. However as the night progresses I'm aware that the air is becoming damp and consequently smells a bit. Of course it's not helping having a dog in the tent but it's the same even if I am on my own and this moist air inside the inner tent is making it difficult for me to sleep through. 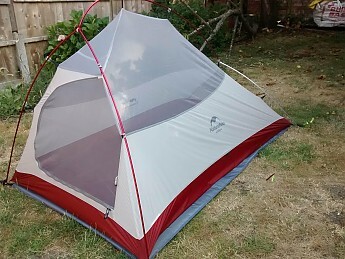 Having looked at some other backpacking tents, eg; Vango Zephros 2, I'm wondering if I should modify the mesh triangle at the end of the fly and have it on Velcro pads so it can be opened rather then permanently sown to the fly. It's covered by the flap on the fly so shouldn't let rain in and although the mesh is breathable it does restrict airflow quite a bit. 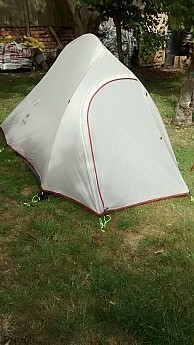 As the fly is not fixed insects can get between the fly and the inner tent anyway so I can't see that modification making any difference other than allowing a better air flow and perhaps getting rid of the moist air quicker. I have attached a couple of photos so you can see what I mean. Is it ok to leave the inner mesh door open at night for added ventilation if walking around the coast ? Maybe this is just because there is no wind at the moment and it will be a problem that solves itself out on the actual trail but I thought I'd ask seasoned backpackers for their advice anyway. Have you tried it with the fly completely off or partially rolled up? On hot nights without a solid chance of rain I'll set up tents like that. If there is a chance of rain I'll set up the fly and then roll it up so it can be on in a flash. That is usually in forested areas without heavy dew though. Not sure how it would work in your conditions so try it as part of your testing. As a confirmed back yard tester I love that you are finding out how your gear works before you head out on your big adventure. That sounds very ambitious for a first trip. Have a great time and come back with stories and pictures to share! Wind makes a big difference especially if your tent is oriented to take advantage of even a small breeze. Netting does restrict air flow. I leave my tent as open as conditions and bugs allow...dont mind a few critters as long as they behave and don't bite. Also having the netting out of the way really feels different and retains the connection with the natural world you have been walking through all day. Have you tried it with the fly completely off or partially rolled up? On hot nights without a solid chance of rain I'll set up tents like that. If there is a chance of rain I'll set up the fly and then roll it up so it can be on in a flash. No I haven't tried that but it sounds like a good idea, thanks. I could try having the fly 50% over and roll it all the way if it starts raining. The forecast is for another 7-10 days of this weather at least ! I've noticed a big difference in the morning with the mesh open. Breathing inside the closed tent seems like you're short of air and have a slight head ache then as soon as you open up the inner netting the difference in air is very noticeable and any "mugginess" in my head goes after a few minutes. It feels a bit like jet lag which I had put down to having a restless night, but the difference in air quality with the mesh open is making me think the netting is maybe doing too good a job of keeping the bugs out and the air with it. But it is letting water vapour escape as the inner tent is always bone dry so it is working. As an aside, one thing I never anticipated back yard testing. The dog hears everything, I ignore it, but if he hears a bird land on a branch or a dog bark in the distance at first he was bolt upright and climbs over me wanting to get out and have a bark. I can't see that going down well on a campsite in Cornwall ! Thanks, when on the trail I'll try to pitch it with the sea breeze, if there is any, blowing through the slightly open inner mesh depending on how infested the area is, if there isn't any breeze I'll try the above posters suggestion and semi pull the fly off. That looks like a copy of the Big Agnes Fly Creek models; interesting. Condensation can happen in any shelter system if the conditions are right. I've even had it collect on open tarps before. While some designs (like many single wall tents) tend to have more issues than others, it can't really be avoided; only mitigated. Good Luck on your trip and lets us know how it went....Sounds like a big adventure! Sounds like a good plan James. I left my netting open a lot in Scotland in May but that was pre-midge season and some of the best weather in decades apparently! With the very helpful advice I've had here so far, I'm hopeful it will be better tonight. On the actual hike I'm travelling as light as I can, I'll be updating my Facebook page by phone, when there's a signal. If anyone wants to follow my progress, I'll post the fb link when I set off - if it's not against forum rules. Here is a long, meandering thread started by me on this issue. Doesn't really say much that hasn't been said above but may be of interest. 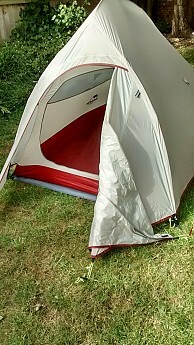 The rule seems to be to open up your tent as much as weather and insect conditions allow. As a fellow dog lover, you might enjoy my recent review of the Big Agnes Copper Hotel, which reflects on the utility of a big vestibule for housing large, wet, furry beings. A tunnel or overhanging vestibule can also open up a lot more ventilation possibilities. Very interesting link, thanks, I can see it's been discussed many times over, and here was me thinking it was just a problem in my Chinese tent ! I hope you can share your trip report here when you get done...would love to see some photos. My last two years growing up in the UK were spent in England. We took a couple of memorable trips to Cornwall and the cliff walking and rocky beaches with tidal pools are still strong memories for me almost 40 years later. Good luck! James, you mentioned some concern, regarding how your dog will behave once out on your trip. Indeed he may settle down in the backyard, once he gets accustomed to the local night noises and smells, but an unfamiliar setting will place him back on high alert whenever something peeks his attention. If he is a barker this probably will become an issue in public camp sites. Eventually he'll calm down once he grows more accustomed coexisting with strangers in a strange world, but that may take weeks. If there is a way to change things up so he gets accustomed to constantly new settings and distractions that may help. Ed, valid point and worth remembering. Fortunately he's a very quiet dog normally so I hope he'll behave in that respect but I'll be on the lookout. Being a Border Collie, the 630 miles will probably be about 900 for him with all the running back and forth ! Hi, a couple of posters earlier in this thread asked to be kept in touch with my hike, well finally my South West Coastal Path walk starts today.